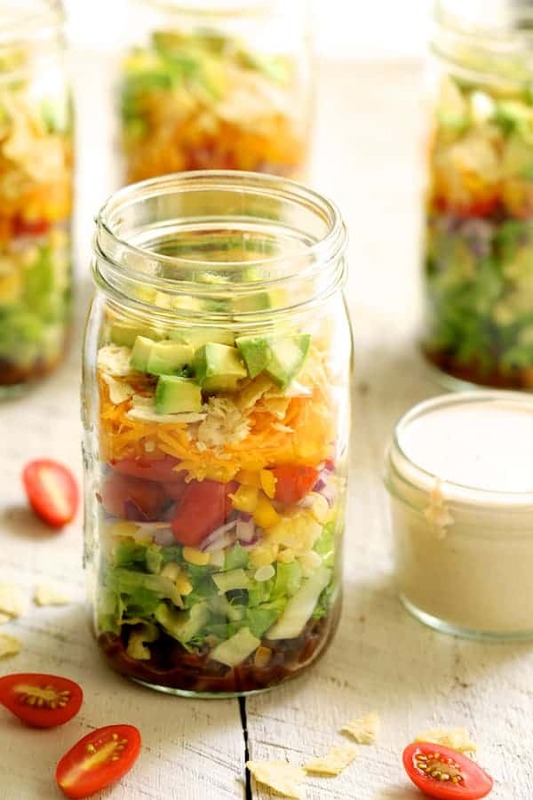 Southwestern Layered Salad is an easy, versatile salad you can make ahead of time. It’s perfect for dinner, a party, potluck or when assembled a bit differently than the recipe in a Mason jar, a great grab-and-go lunch! Hey, all! I have a twofer for you today! I’m sharing a wonderful recipe for this Southwestern Layered Salad AND telling you about the great cookbook it’s in. First, would you believe I have never made a salad in a Mason jar until now? I know it’s a very popular trend. For the longest time, that’s pretty much all you saw on Pinterest. 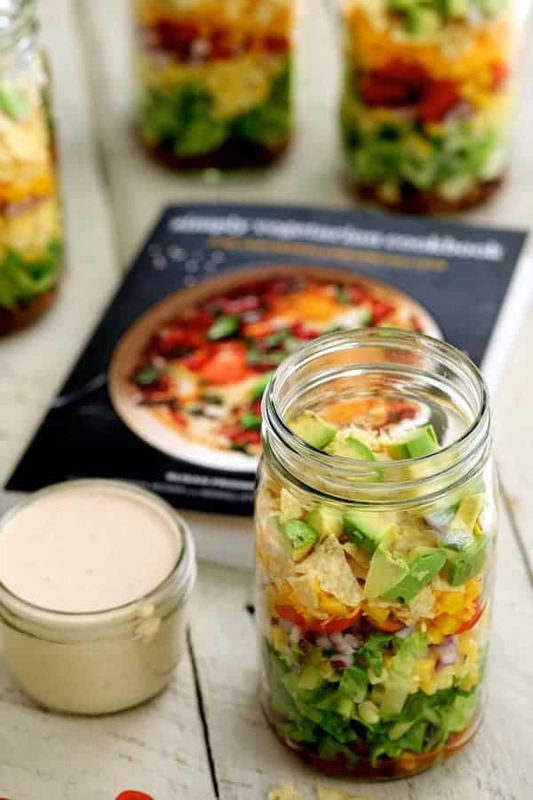 However, when I got Susan Pridmore’s new cookbook, Simply Vegetarian Cookbook, Fuss-Free Recipes Everyone Will Love, I had to give the Mason jar thing a try with this Southwestern Layered Salad. 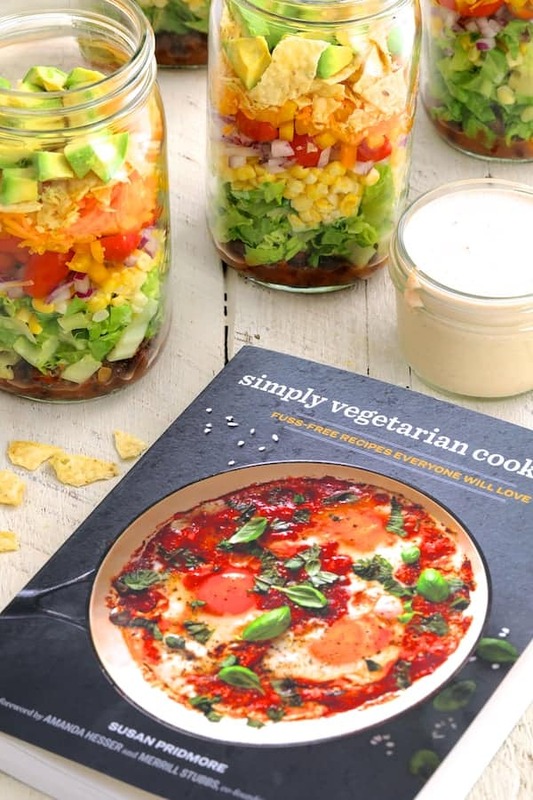 The actual recipe in the cookbook does not call for doing it in Mason jars but rather in a glass bowl. However, it’s just the hubs and me here so dividing it up works better for us. I also would have had to go shopping for a glass bowl. IMPORTANT NOTE: →→→ I layered the salad exactly the way the recipe was written so you could see how it will look in a glass bowl as the author suggests. Before I get into telling you about this easy and versatile Southwestern Layered Salad, let me tell you about Simply Vegetarian Cookbook. Have you ever seen a more appetizing cover photo on a cookbook before? I want to dive into those eggs! 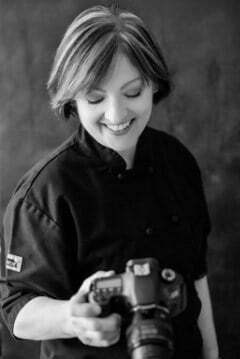 The “mostly” vegetarian author, Susan Pridmore, otherwise known as The Wimpy Vegetarian, is also a trained chef. However, she’s married to someone who is “mostly” carnivore. Because of that, she’s always on a hunt for recipes they’ll both enjoy. This Southwestern Layered Salad is a great example of that. Along with 120 vegetarian recipes, Susan includes “flexitarian” tips to keep meat-eaters happy. For example, Susan suggests adding crumbled bacon or diced roasted chicken to this salad as an additional layer between the tomatoes and the bell pepper for extra protein and a nice color contrast. 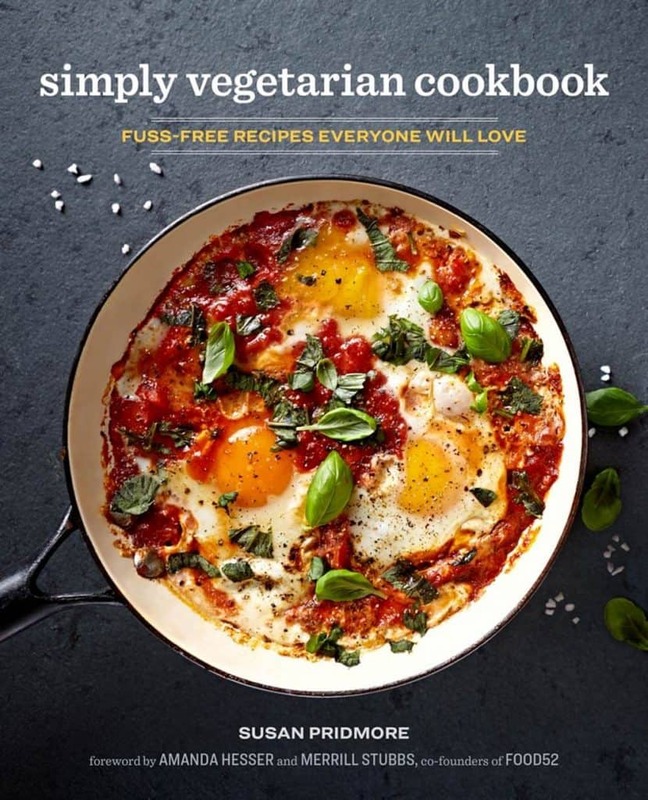 The recipes in Simply Vegetarian Cookbook have easy-to-find ingredients and are easy to make. Recipes like Black Bean Tostadas with Delicata Squash, Curried Cauliflower Tetrazzini and Spaghetti Squash Pasta with Broccolini and Lemon will have your mouth watering! Along the way, Susan provides numerous tips and trips to successfully make each recipe. So now let’s talk about this wonderful Southwestern Layered Salad! This salad is a terrific example of the recipes in Simply Vegetarian Cookbook. It’s easy yet chock-full of fresh, flavorful ingredients. IMPORTANT NOTE REPEATED: →→→ I layered the salad exactly the way the recipe was written so you could see how it will look in a glass bowl as the author suggests. Obviously, when you tip it over and empty the jar onto a plate as shown here, the cheese, tortillas and avocado will be at the bottom. We didn’t mind it, though. After all, it’s salad! 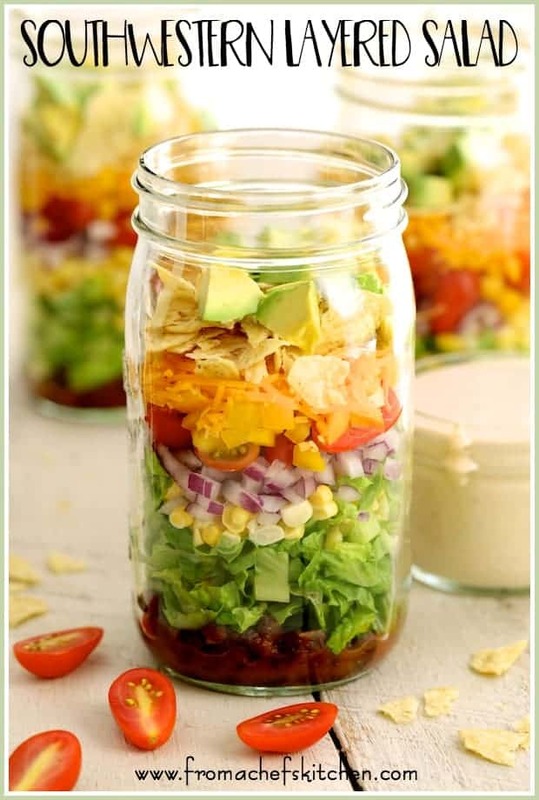 No matter how you assemble it, you will love this Southwestern Layered Salad! Be sure to check out my Lighter and Fresher Seven Layer Dip for another great Southwestern-inspired layered recipe! Rockridge Press sent me a complimentary copy of this cookbook to provide a review. 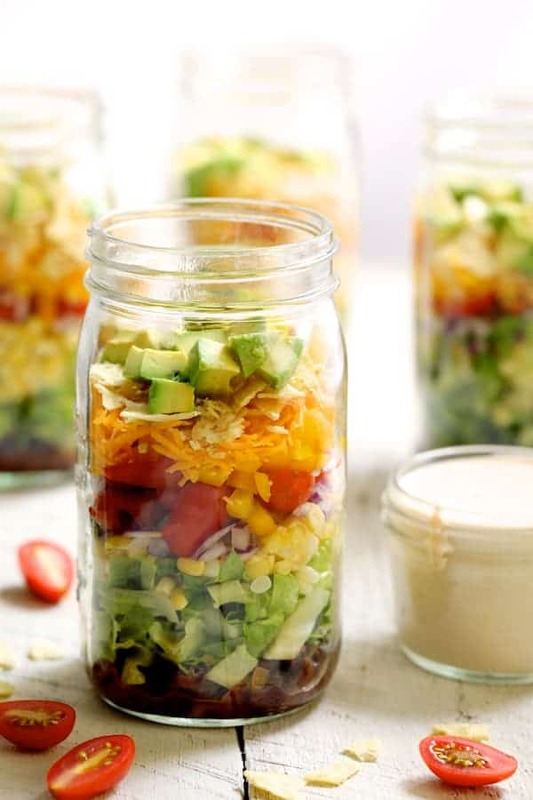 Southwestern Layered Salad is an easy, versatile salad you can make ahead of time. It's perfect for dinner, a party, potluck or when assembled slightly differently than the recipe in a Mason jar, a great grab-and-go lunch! SALAD: In a small bowl, stir together black beans and salsa. Spread across the bottom of a large serving bowl or divide into four individual Mason jars. Layer remaining salad ingredients as follows: Lettuce, corn, red onion, tomatoes, bell pepper, cheese, avocado and tortilla chips. DRESSING: Whisk together ranch dressing and barbecue sauce or seasoning. Serve over salad. I added 1/2 cup finely chopped red onion and made more dressing. I used 3/4 cup ranch dressing and 1/4 cup taco sauce instead of seasoning.